Today has been an extremely busy day on social media with all the hype surrounding the Channel 4 documentary; Plus Size Wars. I watched it & instantly felt so empowered to see blogger friends and idols representing ladies all over the world. 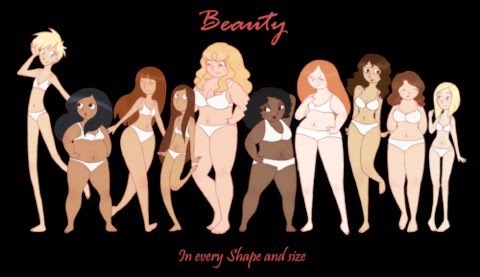 In this debate I sit firmly in the PRO CHOICE category; Every BODY is beautiful and you should be free to live your life how you want to regardless of what size/shape you are. As long as you are happy & healthy that's all that matters in my opinion. Now I find that health is not just about how fit you are but it also extends to your mental health too. I have struggled with yo-yo weight all my life and have had my fair share of health issues and suffered depression due to my weight too. I strongly believe that happiness starts from within and if we can promote confidence & love for the skin you are in then anything is possible. You may reach a point where you feel you want to become fitter or drop some weight or tone up or gain a few pounds or lose a few inches or change any other aspect of ourselves that we may not be happy with and you know what I think that's positive because it acknowledges that we are always changing and we are all unique. Some people are happy the way they are....some people want change...and both are just as beautiful in my eyes. I am so pleased to be surrounded by people who empower & support others, a family of strangers who are infused by common interests whether it be fashion, beauty, food, hobbies...we are all wonderfully creative & gorgeous individuals. I love that you are not judged for being you, that you are accepted and loved regardless of what size you are. I love that you are welcomed with open arms, that you are supported through rough times and celebrated through the good. I am proud to be part of this family!